It seems like only yesterday the 2016 hurricane season came to a close but here we are 6 months later knocking on the door to the official start of the 2017 season. The Atlantic basin has already seen an early April storm with TS Arlene. NOAA released an update recently and are forecasting an above average season. I always take the seasonal forecasts with a grain of salt but to each their own. Always be prepared. As the saying goes "it only takes one" regardless of how active/inactive the season may be. In the near term we focus our attention close to home as historically the NW Carb and GOM are the most likely areas for genesis. Happy cane season and may everyone be safe from harms way. Thanks for freshening up the place Aug! 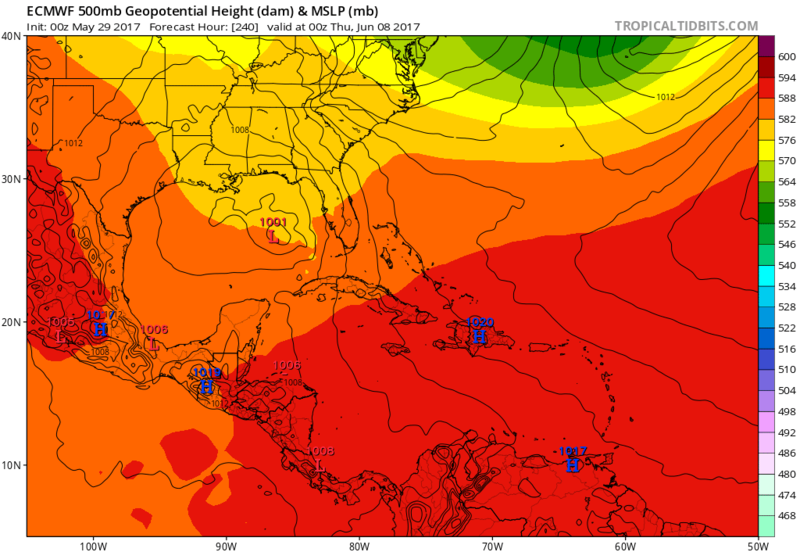 The Euro may be sniffing something, but the GFS and CMC have dropped what they were seeing. 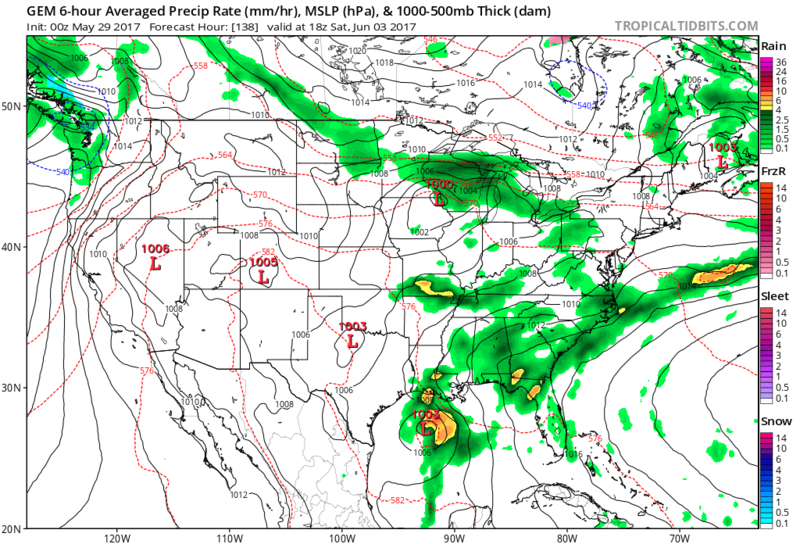 The CMC has a little something earlier in the period. GFS just seems unsettled. We shall see! I see a cloud.....but I believe "IF" anything develops it will be caught in a catch 22. There is 30kt shear over the gulf. Then add in the mix the Gulf is still influenced by a zonal flow from the West. 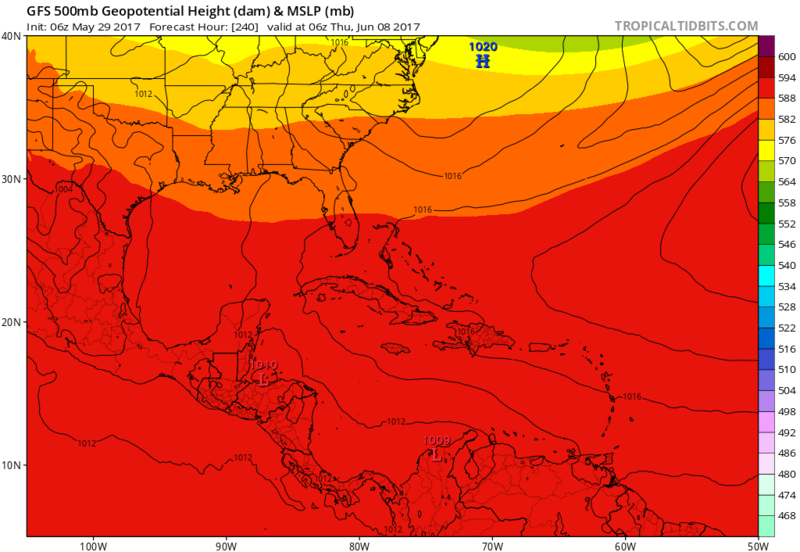 What I see happening is a Low will develop in the Gulf but will never take on tropical characteristics. I think it will sweep faster and more Northeast than forecast...Big rain maker. gomexwx wrote: I see a cloud.....but I believe "IF" anything develops it will be caught in a catch 22. There is 30kt shear over the gulf. Then add in the mix the Gulf is still influenced by a zonal flow from the West. 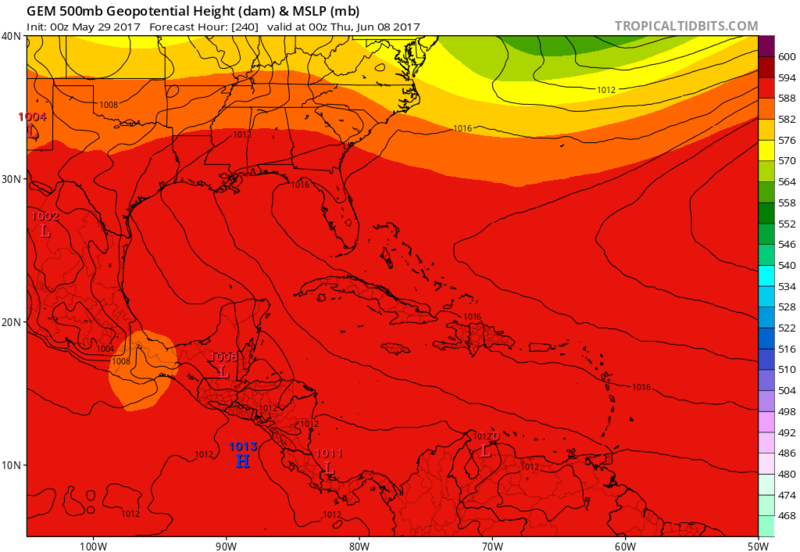 What I see happening is a Low will develop in the Gulf but will never take on tropical characteristics. I think it will sweep faster and more Northeast than forecast...Big rain maker. I am wishing for the rain but you may not after 16.48 and more from yesterday, lol. Your description has me visualizing a Colin type storm from last year and perhaps a Debby from 2012 with the westerly shear and convection heavily weighted to the east of whatever develops, if anything.